Volvo has been discontinuing production of many 240 interior parts & raising their prices on what they've kept. Fortunately, besides what you see below, we do have used original trim, moulding, seat belts, head rests, sun visors, door panels, & other interior parts for 240s in our warehouse - so give us a call with your needs. We also have new window switches, seat covers, & floor carpet sets, which may get listed here sometime soon. Factory replacement interior access cover (with thumb wheel) for the tail light assembly. A pair of these rectangular black plastic panels sit inside the trunk. Factory replacement overdrive push-button shift cap. Factory replacement glovebox lock with a pair of matching keys. Factory replacement black plastic "stop arm" for either the left or right side of the glovebox lid. Aftermarket replacement black vinyl gear shift lever knob, bare. Factory replacement black vinyl gear shift lever knob, bare. Replacement black plastic cover panel. Volvo discontinued OEM ones for both sides. Replacement tan plastic cover panel. Volvo discontinued OEM ones for both sides. Factory replacement plastic casing/enclosure/housing for the interior ("extra") center brake light assembly, black in color. Factory replacement shift knob gear indicator cap. Factory replacement plastic housing for the center rear "3rd" brake light assembly that sits against the back glass. Factory replacement rounded square plastic trim piece for the rear seat release mechanism. It snaps right onto the latch. Factory replacement multi-function turn signal stalk. Original air conditioning rocker switch with blue snowflake icon. Call us if interested in ordering a good used power mirror swtich for either position in the parking brake cover. Factory replacement navy blue plastic right front door pocket. 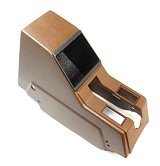 Factory OEM "camel tan" plastic right front door pocket. Made in Sweden. New (old stock). Overstock clearance. Factory replacement black plastic rectangular console plug. Factory replacement metal seat adjustment knob washer. Factory replacement brown plastic door lock knob trim ring. Factory replacement chocolate brown console blanking plate.